Want a relaxing way to enjoy this beautiful spring-like weather? Food is always good to squeeze into the mix and we are overdue for a tasty recipe. Today is designated date night and figs are on the menu. Preheat oven and pizza stone to 500 to 550 Degrees for approximately 45 minutes to an hour. The stone needs to be heated thoroughly. The hotter the oven, the better the pizza cooks. 700 Degrees is actually the ideal temperature but most conventional ovens do not go above 550. One of the reasons an outside pizza oven is a great idea. For the quick and easy method, use large pita pockets for your dough; split the pockets open. If you opt to make your own pizza dough or buy frozen dough at the store, stretch it as thin as you can; the thinner the better. Cornmeal on the pizza peel makes it easy to slide the pizza on and off the peel without disaster. Now let’s prepare the ingredients. Mix two tablespoons of extra virgin olive oil, ½ clove of minced garlic, salt and pepper and ½ teaspoon fresh rosemary chopped in a small bowl. Use a pastry brush to spread the mixture on the pocket or pizza dough. ¼ cup of gorgonzola cheese (I prefer goat cheese as I find gorgonzola too strong for my taste). The cheese should be crumbled in pea-size pieces. You do not want large clumps of cheese. Todd also uses scallions as a garnish. Completely up to you. First cover the pizza with the figs, then spread the gorgonzola evenly and place the prosciutto on top. For pita pockets, it takes two to three minutes for cook time. Fresh pizza dough takes five to ten minutes depending on how thin the dough is stretched. Always check the bottom of the pizza. Keep a close eye. Never wander too far from the oven. Slice and serve immediately accompanied with a fine salad of greens (mesclun and/or arugula drizzled with a balsamic vinaigrette) and a glass of Chianti. This is a healthy meal for an early spring evening. Enjoy. For all the latest, up-to-date tidbits, trends and tips, join our Facebook Fan page http://www.facebook.com/pages/Bilowz-Associates-Inc-Our-Blog-Annies-Gardening-Corner/325316334444 and follow us there. You get more than just the blog postings! 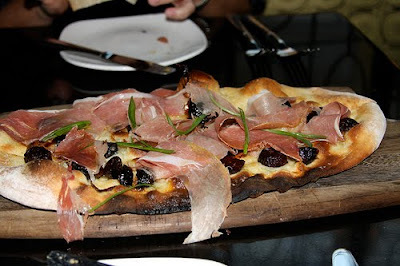 Image of Fig and Prosciutto Pizza from the Internet.